US Secy of State John Kerry is leaving Kuwait and heading to Jordan on his latest Mideast shuttle diplomacy mission. U.S. Secy of State John Kerry is leaving Kuwait and heading to Jordan on his latest Mideast shuttle diplomacy mission. Kerry is scheduled to arrive late Wednesday in Amman, which he plans to use as a base as he travels back and forth between Jerusalem and Ramallah, AFP reported. 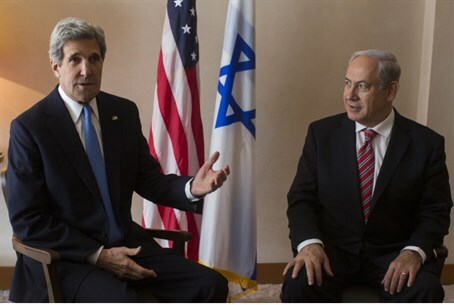 It is Kerry’s fifth visit to the region since taking his post in February as the top U.S. diplomat. Speaking Tuesday in Saudi Arabia, Kerry said President Barack Obama’s administration hopes to bring about peace “notwithstanding all of the conflict, notwithstanding all of the counter indications. “We believe – President Obama believes – that those negotiations should start as soon as possible, and hopefully that they should conclude with two states living side by side in peace and security,” Kerry said. He praised Saudi Arabia for that country’s 2002 proposal to recognize Israel in return for withdrawing from all lands restored to the Jewish State in 1967 after ousting its Arab attackers in the Six Day War. But most military analysts have concluded that such a proposal is not practical for Israel, in that it would create an existential threat to the Jewish State. Prime Minister Binyamin Netanyahu has stated he is willing to restart final status talks with the Palestinian Authority at any time, in any place – but without preconditions. The PA, meanwhile, has demanded that Israel halt any Jewish construction in Judea, Samaria and parts of Jerusalem restored to the capital in the Six Day War as precondition for talks. Meeting last week with European Union foreign policy chief Catherine Ashton, PA Chairman Mahmoud Abbas said the PA is committed to “the success of Kerry’s efforts to save the peace process” with the goal of an independent PA state. Kerry reportedly sought the assistance of Kuwait in funding support for the PA government after years of friction due to PA support for Iraqi dictator Sadaam Hussein, who occupied Kuwait during the 1990-1991 Gulf War. The PA is especially in need of financial support at present, given that its newest prime minister has just abruptly resigned after only two weeks on the job – and that in the wake of the resignation of former Prime Minister Salam Fayyad. Both men, who are veteran economists well respected in the international financial community, reportedly left due to power struggles and other problems with the PA chairman. U.S. officials say they believe it is critical to make some progress prior to September – when the United Nations General Assembly convenes, and when PA Chairman Mahmoud Abbas could once again launch another unilateral initiative in the international forum.